Steps to begin the online course process. Step 2: When you arrive at the "Login" page, click on "New Account." Step 3: Fill out the required information on the "Signup" page. Step 4: After sign-in is completed, click on the "Catalog" button and add the Piercing Course to the cart. Step 5: After selecting the course, click on the "Shopping Cart" button and pay the course fee. Step 6: You are now ready to begin your Online Piercing Refresher Course. Good luck, we hope you enjoy. 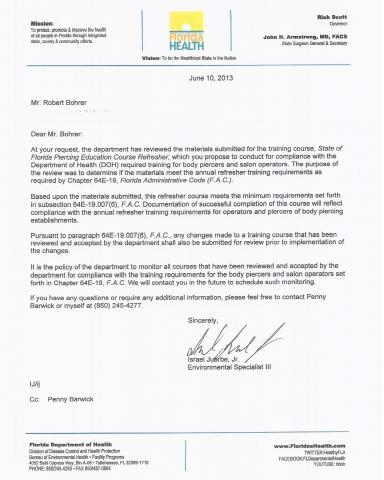 To see our Florida Department of Health Piercing Course approval letter scroll down to the bottom of the page. If you would like to see our class in your area, then please call (561) 707-6837 or (561) 676-9518 or email us to be put on our interest list. Once we receive enough names on our list from a certain region of Florida then we will schedule a date, time, and location for that particular area. We offer private classes and classes from our office at 7410 S. US Highway 1, Suite 305, Port St. Lucie, FL 34952 so if you're interested, please contact us to get more information. 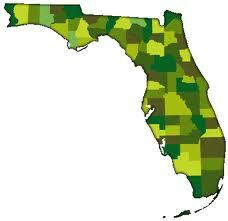 Scroll down further on the page to see the list of classes scheduled throughout Florida. Note: Money orders must be received at least 7 days prior to class. All classes are subject to cancellation due to lack of attendance. Once you pre-pay and receive a Paypal confirmation you are registered for the class. No refunds will be granted, all sales are final.